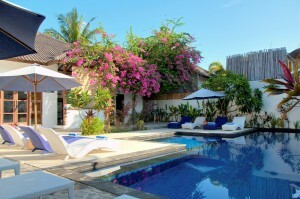 Tir Na Nog, a famous name for its cozy and charming place to chill out on Gili Trawangan. The new fully renovated bungalows of Tir Na Nog gives visitors opportunities to have a total relaxation, away from hassle and bustle. 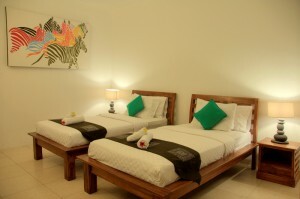 Located directly on central of activities on Gili Trawangan, Tir Na Nog Bungalows has all facilities. Good value for money quiet and very private. Tir Na Nog also offers guest accommodation in the form of 10 deluxe villas, each of which is equipped with hot water, A/C, private balconies, fully furnished and plumbed for fresh water. That said, there is still room for some development on the complex if a shrewd investor would like to expand. All rooms have individually controlled air-conditioning, private terrace, bathroom with cool & hot fresh water shower, international satellite television.